Qld Labor trying to close major rifle club? Email your objection TODAY! Home /Featured, Politics/Qld Labor trying to close major rifle club? Email your objection TODAY! Queensland’s Labor Government have launched a consultation (click here and scroll to the bottom) to spend $millions to further develop and permanently keep a shotgun range built for the 2018 Commonwealth Games. “Great!” you say. But the whole exercise is an anti-gun plot straight from Jackie Trad’s textbook. This plan would cut off the ranges of Queensland Military Rifle Club. That club has over a thousand members and many thousands of range users each year. It is both a rifle and pistol club. Its pistol section hosts hundreds of shooters each week. It is the most pro-gun place to be Brisbane. The proposed shotgun range would operate for a tiny number of users: shotgunners. They only use shotguns. If you compared the potential users of the shotgun range to the actual users of QMRC’s ranges, you’d find the shotgunners were more fuddish and controllable. They’re more likely to be happy for your pistols to be confiscated because it doesn’t affect them. Queensland Labor are willing to spend millions of dollars to plant a tiny number of relatively fuddy shooters and displace a diverse, actively pro-firearms club (QMRC). See the full government proposal here (click here). I write to object to the proposed Ministerial Infrastructure Designation (MID-0518-0279 – Belmont Shooting Complex). The proposed retention of the shotgun range would take away half (or more) of an irreplaceable 300m range used by thousands of rifle shooters. The shotgun range would likely cut off access to an excellent 50m pistol range. Both ranges are also used by the Queensland Police Service and Defence members and cadets. Spending millions of dollars to benefit a tiny minority of shotgunners and alienate thousands of sporting and occupational rifle and pistol shooters is a disgrace. The proposed designation should not be made by the Minister. It is a waste of public money and politically motivated. 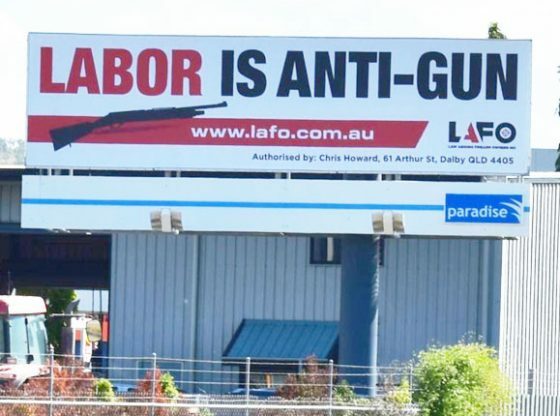 Law Abiding Firearm Owners Inc (LAFO) is a large group of Queensland shooters who have put sectional and political interests aside to unite against unjust firearms policy. LAFO - Law Abiding Firearm Owners Inc. Impressive that you can steal dozens of seized guns from the Police and not go to jail. Craig Robert Everett, 34, pleaded guilty to stealing firearms and ammunition as a public service employee on Wednesday. The materials presented on this web site are provided as an information source only. Law Abiding Firearm Owners (LAFO) makes no statements, representations, or warranties about the accuracy or completeness of, and you should not rely on, any information contained in this publication. Despite our best efforts, LAFO makes no warranties that the information in this publication is free of infection by computer viruses or other contamination. LAFO disclaims all responsibility and all liability (including without limitation, liability in negligence) for all expenses, losses, damages and costs you might incur as a result of the information being inaccurate or incomplete in any way, and for any reason. LAFO understands any World War II images on this web-site to be in the public domain. If we are mistaken, and a copyright holder would like better attribution, LAFO would be pleased to do so. Or, if a copyright holder wants the images removed, of course, LAFO will do so promptly.